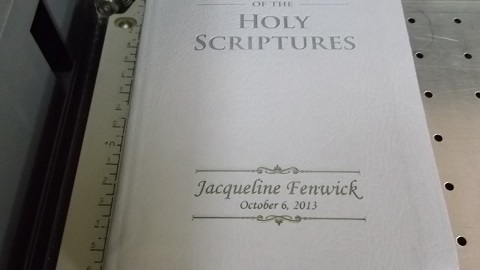 Idle Time Designs is able to engrave your bible and books too! If you think of it, we can engrave it! You can customize your bible and books easily by ordering directly through our website using our preferred financial services with PAYPAL. We have many additional options to choose from besides what is listed on our website, additional charges may apply. 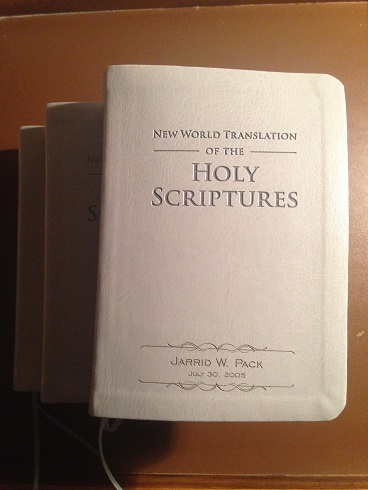 Whether you have the New World Translation (NWT) of the Holy Scriptures (published by Jehovah's Witnesses) or any other book, we can engrave most of them. Please Note: WE DO NOT SELL BIBLES! You must place an order either over the phone or through our website and send your bible or book to Idle Time Designs. Our address is located at 4423 Railroad Ave. Harrisburg, NC 28075. Idle Time Designs is not responsible for damaged shipments, so please pack your bible or book securely so that it may deliver to us in one piece. You are responsible for paying for the shipping of your bible or book to us. We recommend using shipping companies who have tracking capabilities such as USPS, UPS, & FedEx. To place your order, review the different available options below and select from the drop down option that matches the design you would like. Currently we do not offer rush shipping online. Normal lead time is 3-5 business days after receiving the bible or book for engraving. Idle Time Designs will send an email "Proof" of the design before engraving that must be approved by the end user. Style: Currently we offer three style options on our website. You can order just with a name, a name and date/message, or a name, date/message, & with Ornamental Lines. If you order with too many characters, Idle Time Designs will call you or email you and advise to change if needed. Design - Ornamental Lines: Currently we offer 5 different Ornamental lines to choose from on our website. Design - Text/Font Style: Currently we offer 5 different fonts to choose from on our website.